Paradise found! This luxurious 5 bed 4 bath home on Crescent Lake is a dream home in a high-end community. Spanning over 3000 SF, this magnificent waterfront residence graced by soaring ceilings and wall-to-wall windows is a haven for gazing at Crescent Lake from multiple vantage points. The main entryway draws you into a voluminous layout made for entertaining. The 2-story great room with stone fireplace and French doors to the deck is a dramatic focal point, accompanied by an inviting dining room, and tremendous kitchen. The master suite presents high ceiling, French doors to a spacious deck overlooking the water, an ensuite with a tiled glass enclosed shower and double sink. The lower level has a large rec room with wet bar, two bedrooms, laundry, and storage room. On the second floor there are 2 additional bedrooms and a full bath. 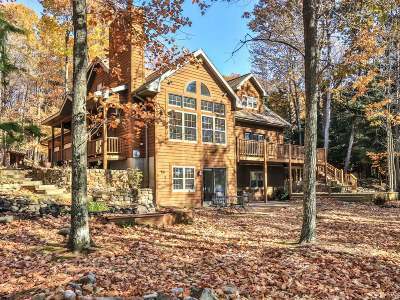 Privacy is yours with 200&apos; of lake frontage, large pier, a pond with waterfall, all on a wooded 1.14 acre well-manicured lawn. Your paradise waits!